I still remember lying in bed in Bountiful, Utah, and getting a phone call from a family member asking if I had the TV on. Being a BRAND NEW officer in the United States Air Force, I had no clue the impact that this day would have not only on my career in the military, but on the United States as a whole. I know that I, along with many of my other brothers and sisters in arms, have more than a paycheck keeping us in the military at this time. Our deployment tempo has more than doubled. Our military personnel are more tasked than any time in our lifespan. We are changing the way we train our troops. The entire focus of and the way the military operates has shifted. In a matter of a few short hours, we were put on the defense. We had not had an attack on our homeland since Pearl Harbor. I ask that you do all that you can to support our troops as we go forward defending our freedoms our liberties and fighting to bring safety to our nation and our families. It is what we do, that allows you to do what you do. I can't believe my seet little girl turned 3 today! It seems like just yesterday that we were bringing home a tiny 5 pound baby. You have been a blessing to our family and I can't imagine life without you. You are so independent and have such a love of life. You are very strong willed and won't let anyone push you around. I love the way you talk and your sweet kisses. I love that you try so hard to do things and you are always trying to please others. I love how you treat your little brother with such love and understanding. You are gentle and kind and have such a love and passion for life and all that it has to offer. I love how you laugh at your own jokes, and then tell them again to laugh again. We celebrated today by having and doing all of your favorite things. We ate donuts for breakfast and played all morning at the YMCA. Then we had Princess Spaghettios for lunch and you INSISTED on chicken nuggets and french fries from Wendy's for dinner. You only wanted a pink cake with pink frosting on it, and pink ice cream to go with it. So, I indulged you and we had a thoroughly pink Princess day. I'm sorry that you didn't get the pink doors you asked for, but mommy and daddy just don't like pink as much as you do. I'm so glad that you had such a good birthday. 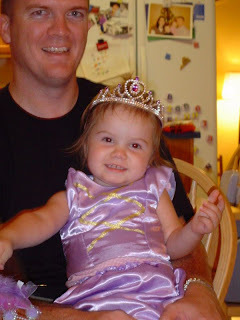 You are truly a Princess! I love you Sweet Pea, Happy Birthday! 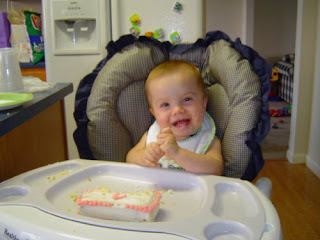 K on her first birthday. K on her second birthday. C started preschool last week. His birthday doesn't come until November, so he will have to wait another year before Kindergarten. Needless to say, he and I were both ready for it. And, he LOVES it! He loves the teachers, the other kids, and I think he likes to get out of the house on his own for a little bit. It's going to be a good year. He insisted on standing in front of the front door before his first day of school. Me: K, what do you want to have for your birthday? K: Pink cake. With pink frosting. and those things that go up and down on the merry-go-round. K: Cake. with those things that go up and down on the merry go round. K: No, the things that go up and down on the merry go round? Me: The things the horses are attached to? K: yes. they go up and down. Me: Oh, the poles. You want the poles from a merry-go-round on your cake? C: Yea, mom, don't you know, the poles that are with the horses on the merry-go-round. K: And it needs to be pink, with Princesses too. Me: Um, Okay, I'll see what I can do. It took me about 2 or 3 hours to figure out she wants candles on her pink cake with her Princesses. Smart girl. She didn't know what they were called, but she knew what to compare them to. Especially the ones with the stripes running diagonally down the pole - looks just like candles. 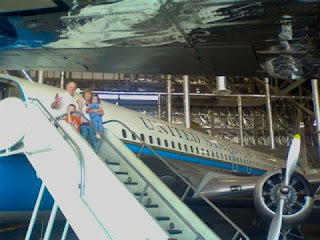 We had such a fun visit with Grandma and Grandpa Mabray this past weekend. 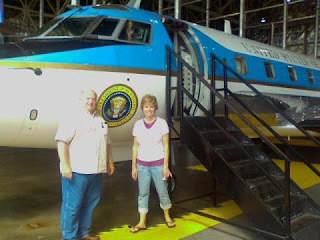 We were able to go to the Air Force Museum so they could see the Presidential planes, we ate - A LOT-, we visitied, we went to church, we ate some more, and overall we had a really good time. C has a new Oreo eating buddy and K loved to have someone else to play Princesses with. C insists that we move to Texas to be closer and and K thinks that 'Grandpa and Grandpa' are the best thing since Peanut Butter and Jelly sandwiches. Thanks Grandma and Grandpa for coming and visiting. We can't wait until the next time we get to see you! One of the things that our church does for infants is give them a blessing. We have waited to do this with E because we weren't home. And then, we wanted Grandma and Grandpa to be able to make it. It is one of my favorite times. We were able to take some pictures from that day. Here are some of my favorites. Last week we had a very busy week. We were trying to get ready for Grandma and Grandpa to come over the Labor Day Weekend. We also had soccer practice, a temple trip with the youth, preschool meetings, play group, and the list goes on and on.